Kubera; apart from being the Guardian of treasure, is also the Over Lord of the Mystic Energies who are Guardians of various forces in the Universe, like the Yakshas and Yakshinis. There are some Yakshini Sadhakas who believe that worshipping and invoking Kubera first, before commencing the Yakshini Sadhana proves most beneficial and the Yakshini can be attracted. In this post I will explain how the Kubera Yakshini Sadhana is done by chanting a specific Kubera Mantra. 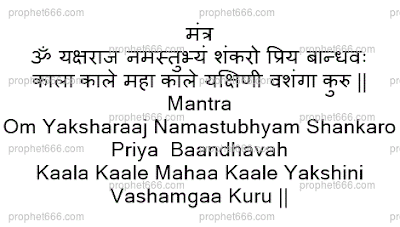 The Sadhaka first chants the Kubera Mantra given below and then commences any Yakshini Sadhana. There are certain restrictions the Sadhak imposes upon himself to enhance those qualities in himself which are dear to Kubera. These are given below. Never sleep during the daytime and at night sleep on the ground. Take only 1 meal in a day and not to eat anything in the night. Include a Milk Preparation, like Kheer in the meal and always prefer Whit Colored Items in the Meal. Keep a Moun Vrat [Vow of Silence]. Apply a Tilak of Rakta Chandana on the forehead. These are all Satvik Kriyas and if one does not instill them in oneself, it is not possible to invoke Kubera. Sir, I want to apologize to you the mantra that you had given earlier for Ratipriya Yakshini Ji's is working. Before doubting u I was chanting that mantra nonstop from last 2 weeks. The day I asked you the question about that mantra she had given me the proof that i'm chanting a correct mantra. What's the proof that makes you sure you had invoked her successfully? Did you draw a painting of her? 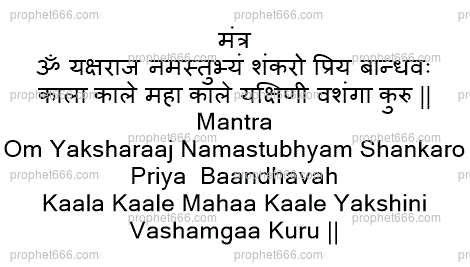 how long we have to chant this mantra before we can start yakshini sadhna Guru ji ?